Must say, I got amazed when I saw the thumbstick 8-Way Power Functions remote control from Jason Railton for the first time, this week at LUGNET (on the left). 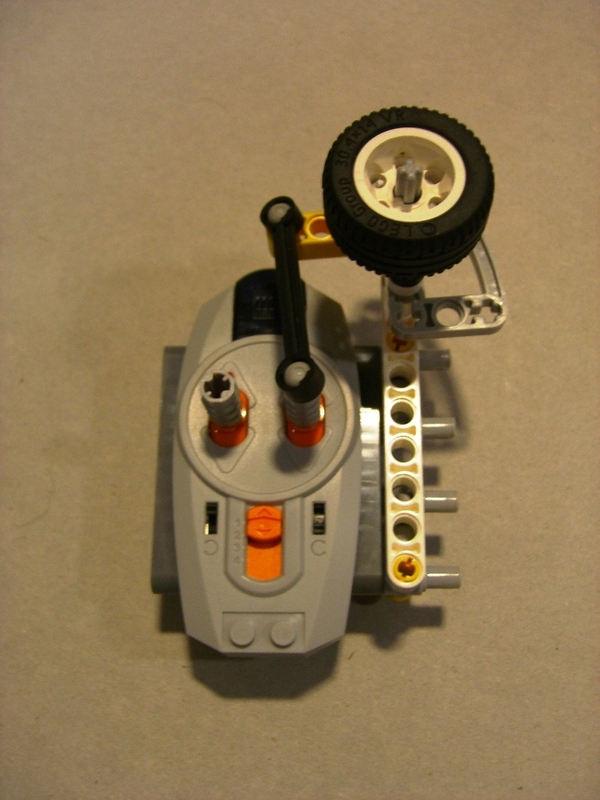 With the advent of Power Functions in 2007, it was launched the LEGO Power Functions IR Remote Control (on the right). This remote features simultaneous control of two ports (A, B) for one of four channels at a time, from two 2-Way controls. Polarity is also configurable for each port, at the remote. 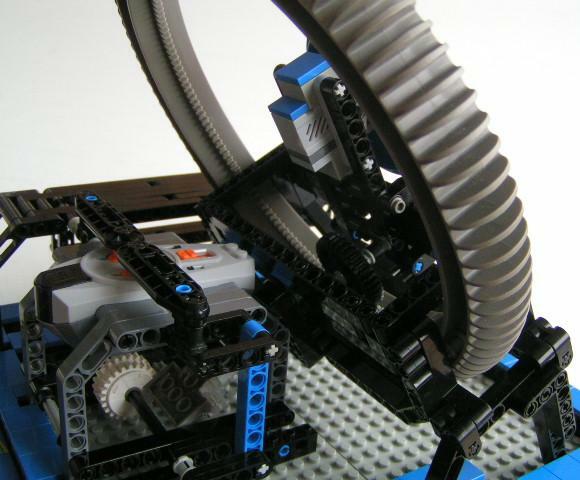 The way it operates, makes use of 'Combo Direct Mode' as described in the 'LEGO Power Functions RC Protocol' and which LEGO released for Open Source recently. This mode has timeout for lost IR. 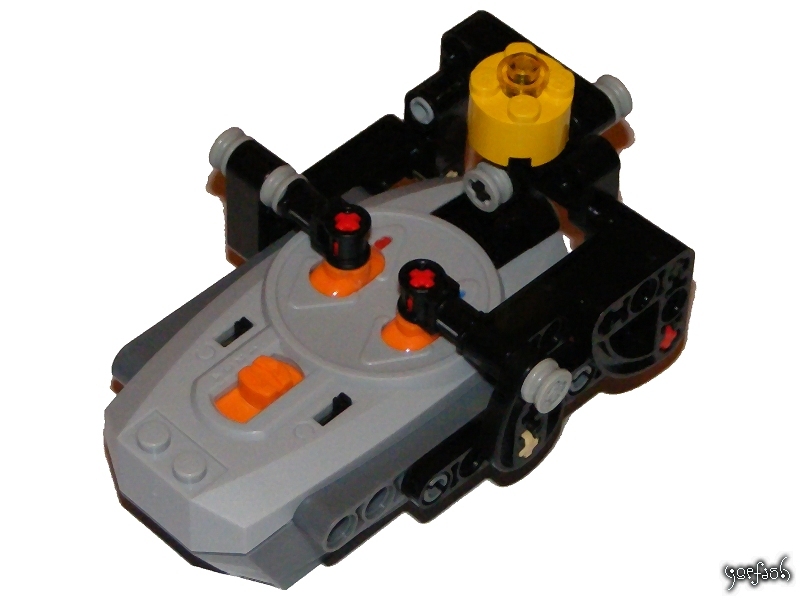 None of these is available from the current LEGO PF remote. 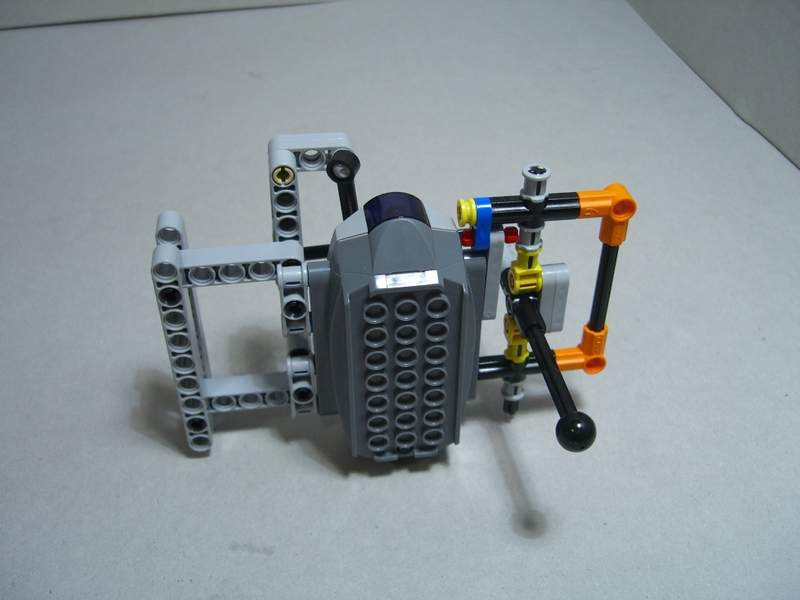 So we can expect for news in this domain, either from LEGO with the new TECHNIC sets for the coming years, or any other OEM who may get interest to develop hardware for PF (actually there are still some constraints to this, as referred here). 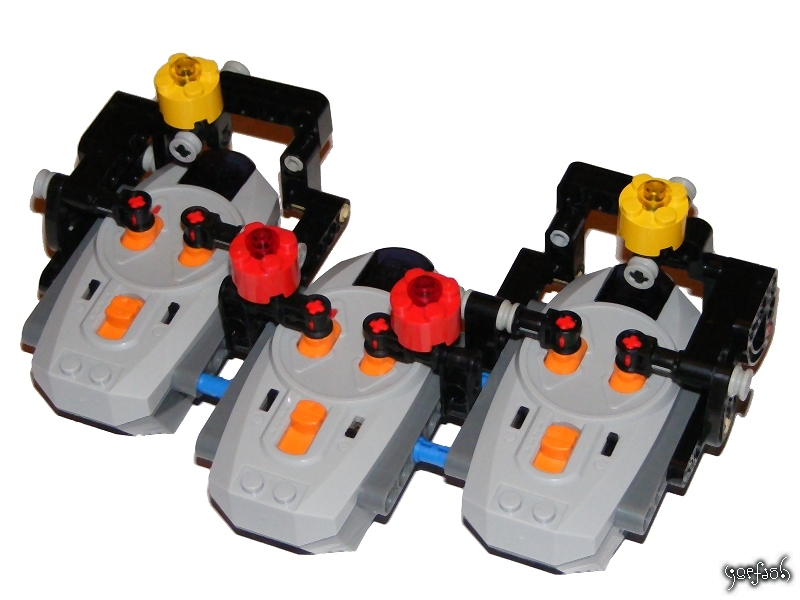 Some of these modes/features, may never be released as of-the-shelf remotes, but left for MOCs or even integration projects with LEGO MINDSTORMS RCX or NXT (see ahead in this post). Meanwhile several skilled builders, developed their own efforts to expand the standard remote usability. 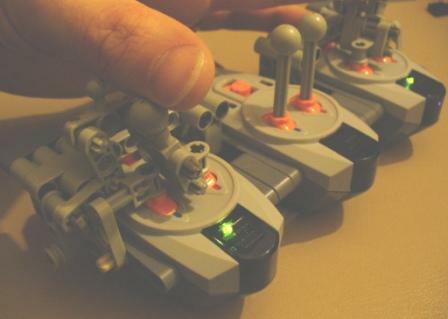 A first development was made by Mark Bellis back in March 2007, with his Joystick-Controls (more photos here). handset give a lever length equal to the joysticks. 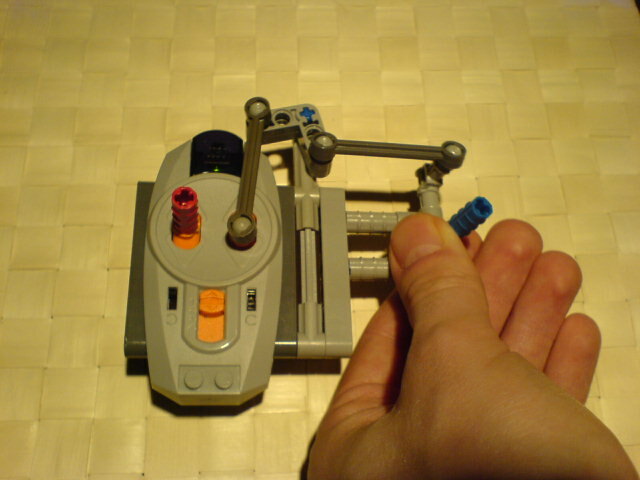 Later, several other Remote Control creations with similar or different functionalities arose. See them and chose/adapt the one that best fits your needs. On the previous TBs post, about RC PF trucks, we saw a steering wheel remote from ZED in action. Very simple, effective and with a good design! 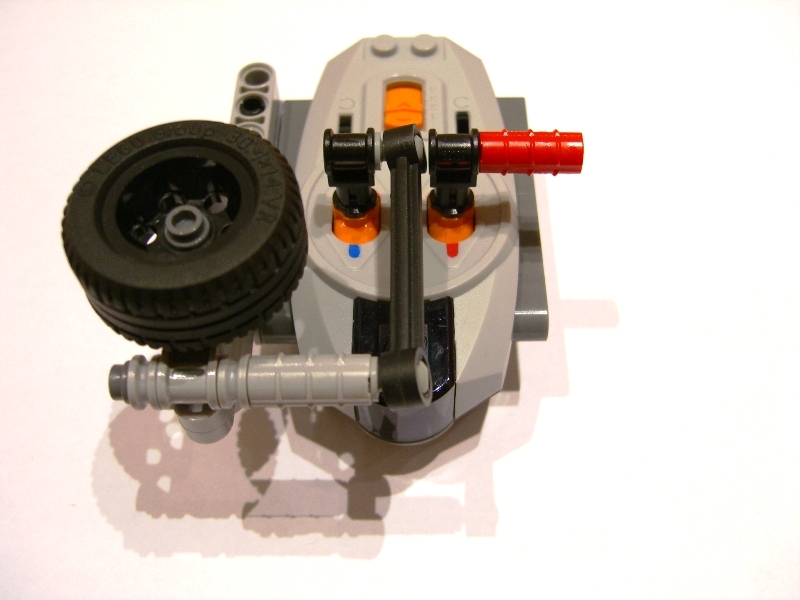 Pedro Agnelo, have also a few examples for a steering wheel remote, at his Brickshelf folder. Here the first try (left), and here the correspondent evolution with build sequence pictures (right). At right also a 4/8-Way remote from Paul (Sariel) from LUGPol, who is already a frequent reference at TBs. This is a 2 hands control, where 2-Way transversal movement is transformed into a longitudinal one to actuate the PR remote. See more pictures from his Brickshelf folder. 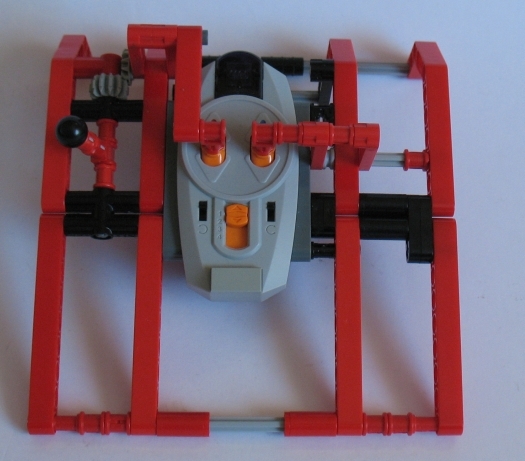 Another similar construction, from Bobofrutx (also a LUGPol member). Also from previous TBs post, we can see a similar 4/8-Way remote from Marek (LUGPol again... It seems everybody there, is building around the same subject ;) ), for two hands operation. However this video was not directly posted, but others did. It is model inspired on Bobofrutx (above) and Duku (below in this post). See more here. 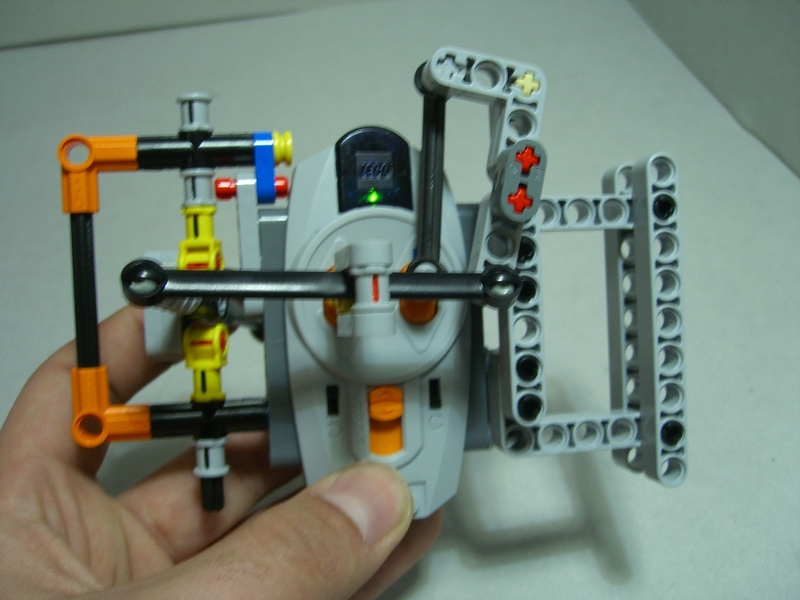 Pedro Agnelo, designed another pure 8-Way remote, quite different/innovative, and which you can see more in detail at his Brickshelf folder. 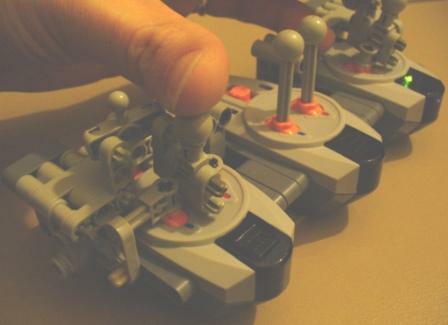 It’s a two-axis joystick that lets you move the stick up/down/left/right (+diagonals) and operate the two IR RC outputs of the selected channel. The up/down movement operates the right (blue) port, while left/right movement operates the left (red) port. 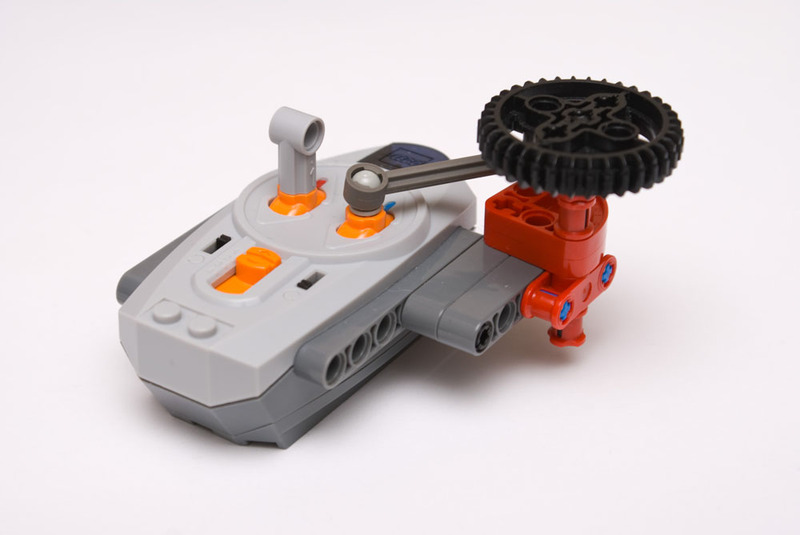 Jason next challenge, is to make a similar thumbstick controller, for a mechanical tank. It should be an 8-Way like this one, and capable to translate the up/down/left/right (+diagonals) instructions into tank drive commands. But it seems the diagonals are not easy to deal with... can we help him? LIEBHERR R964 model from Fabio Sali, at LEGOWorld 2007. 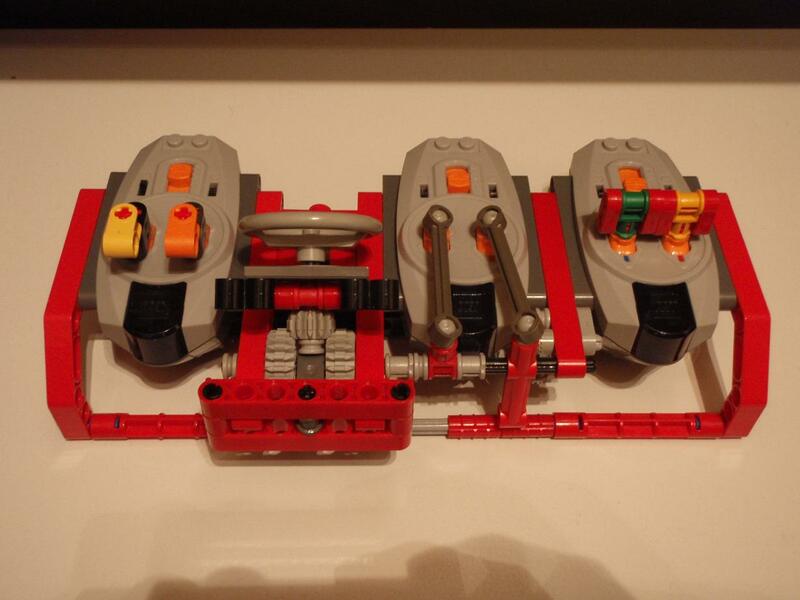 A creation from Duku (LUGPol) with a real steering wheel. See more details at the respective Brickshelf folder. Immediately after LPF protocol release, some experts started writing code to implement the new PF modes within existing hardware. 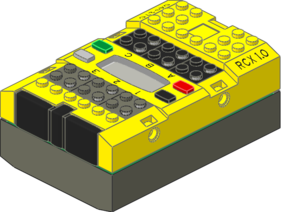 Bob Kojima developed code for RCX and BrickOS, so that with his firmware it is possible to control LEGO Power Functions devices with a RCX. The great advancement is that it can issue PWM commands, for the Power Functions IR Receivers and this way control motors speed (stop and 7 speeds forward/backward as allowed by the protocol). John Hansen together with Jason Railton, adapted the NBC and NXC API functions for the HiTechnic IRLink device, to support the newly documented Power Function modes as well as the RC Train IR protocol. This way with a NXT and an IRLink sensor, it is possible to make use of all modes/commands that LPF protocol allows (Single Pin timeout or continous, PWM,...). I loved Zed design but Sariel's seem to be more effective for me. 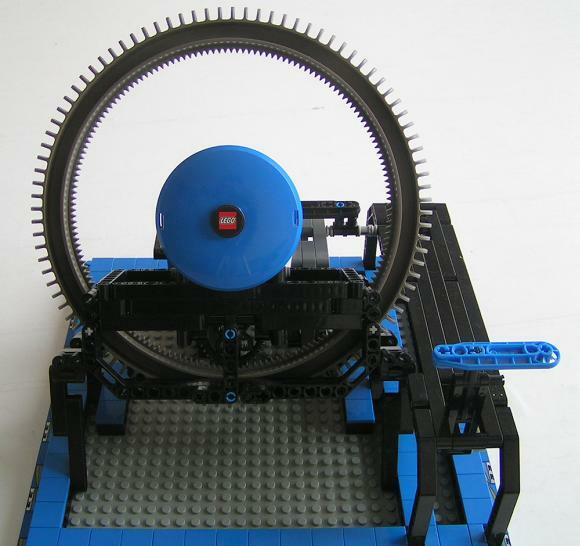 TECHNIC ingenuity at its best! 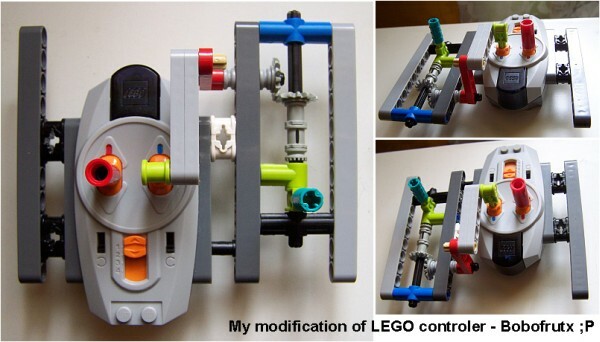 Thank goodness LEGO put the remote controller's axleholes exactly aligned with the controls' axis: this creations like these much easier. 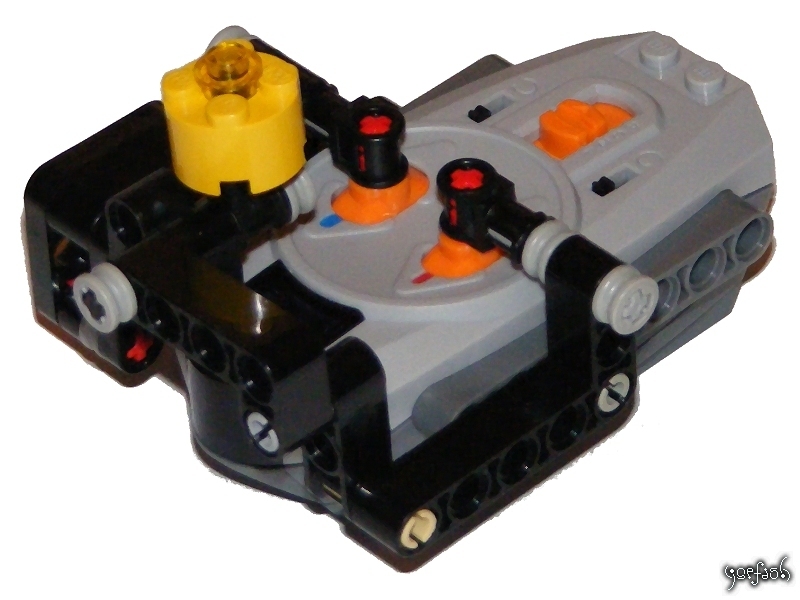 Now, to expand on the PF protocol and fulfill all its possibilities, it would be nice if LEGO launched a modular transmitter: possibly using the PF connector, there could be separate modules for batteries/transmitter, channel choosers, and controls (pushbuttons, switches, analogue inputs...). This would make building a transmitter to suit each model's needs much easier. 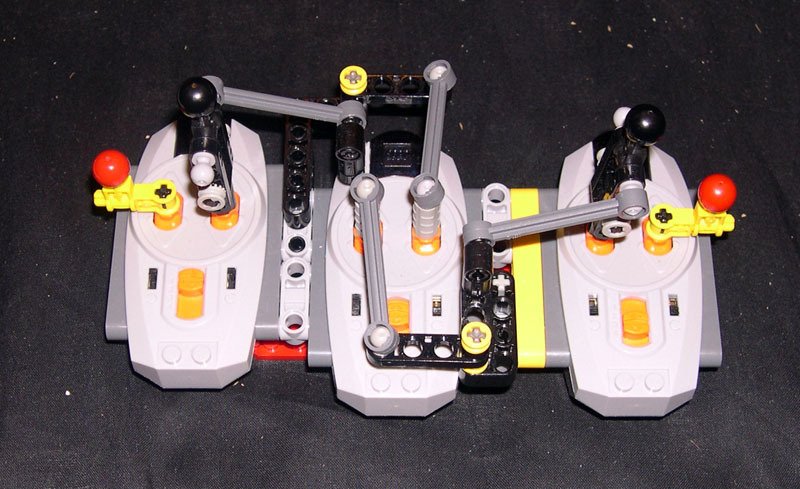 Oh, and I forgot: that's great news, about the MINDSTORMS pBricks now being able to control PF receivers! I knew it was only a matter of software, not hardware... can't wait to get an NXT IR Link, and to have the code implemented in NQC (I don't like BrickOS' hassle much)! Maybe because the Remote is not easily visible. This is my PF remote controller modification. Probably not the best, but IMHO the design is compared to many others much better. I own a Hitechnic IRLink, and I will be recieving the new IRLink Power Functions NXt-g block 1.1 beta version, once they have created it. Is it possible to have the IRlink control 8 channels? The main limitation is that the IR recievers have a 4 channel switch, but it still might be possible. Current IR receivers can choose only among 4 channels; although the protocol allows for more, the current hardware can't cope with them. Surely a new receiver model, also with this one's bugs solved, will appear with all 8 channels... or maybe even HiTechnic, MindSensors or others will come up with something of their own.